Joshua Nakama is a soloist and chamber musician in the Hartford area. He began his studies in the guitar with teacher Jeremy Soule playing fingerstyle acoustic and jazz. 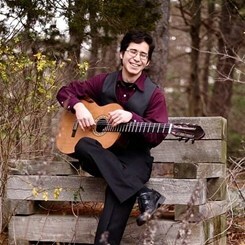 In 2012, Joshua began pursuing his Bachelor of Music degree in Classical Guitar Performance with Professor Christopher Ladd at the Hartt School of Music. Joshua's playing has been heard in Boston, NYC, Japan, and throughout the Southeast US. Performances of note include performing for the Governor of Massachussetts and the Mayor of Worcester at the Bicentennial Celebration of Park Congegational Chuch as well as at the DiMenna Center for the Guitar Foundation of America Regional Symposium with the Hartt School Guitar Quartet. Joshua plays a lattice-braced 2014 Alan Harold Chapman guitar. Request Lessons with Joshua today!